For pianist Gwenaëlle Rouger, the concert is conceived as a moment of experimentation, as much for the audience as for the performer; a time and space in which questions are expressed through engaging the senses. This explorative approach provides the creative impetus for the development of her performances, which bring together notated contemporary composition, improvisation, live electronics and installation. French pianist Gwenaëlle Rouger completed her initial training in Paris and received her Diplome d'Etudes Musicales in 2005. Her interest in contemporary music and its aesthetic discourse led her to pursue four years of further studies with the composer and pianist Carlos Roque Alsina. In order to pursue her research interests in greater depth, Rouger is currently undertaking a Masters degree in Contemporary music performance at the Royal College of Music in London. 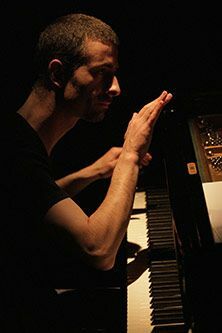 In 2008, Rouger was a finalist in the X.Montsalvatge International piano competition for contemporary music performance and since has played as a solist or as a chamber music member in a number of venues internationally, including the Palace of Congress (Girona, Spain), the Arsenal (Metz, France), 104 (Paris, France), Cadogan Hall, Cafe Oto (London, UK). She particularly enjoys collaborating with young composers, which has resulted in her premiering many of their works. Gwenaëlle Rouger is pianist and co-artistic director of soundinitiative ensemble.